The youngest of the 17 "terrorist" suspects arrested last Monday, has been named. He is 19 year old Omar Hamed. Like all other arrestees, Hamed has been charged with firearm offences and may face "terrorism" charges. Hamed was also instrumental in organizing the recent protests against the US-NZ Partnership forum and also lives and helps run A Space Inside Social Centre, an Anarchist collective on Symonds Street. Omar Hamed was a founder and leader of the anarchist/socialist organisation, Radical Youth which has organised several demonstrations in Auckland, mainly around youth wage rates. Some members of Radical Youth have undergone activist training at green MP Sue Bradford's Marxist training school, the Kotare Centre at Wellsford, north of Auckland. Omar Hamed has travelled extensively in the Pacific to network with fellow radicals. In late 2006 he was in New Caledonia attending the conference of the ultra militant Kanaky and Exploited Workers Union (USTKE). Hamed's work with Students for Justice in Palestine has brought him close to fellow militant Harmeet Singh Sooden, who gained worldwide fame in late 2005 after being kidnapped for several months by Iraqi militants. 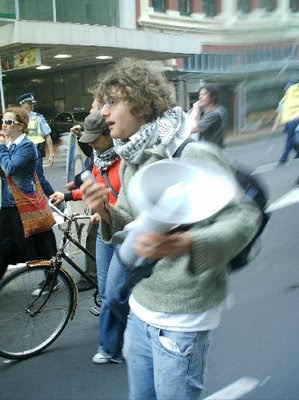 In 2006 Hamed travelled to Australia to protest against the G20 Summit in Melbourne. In an article on the Summit, Hamed quoted that favourite of anarchists and Maori radicals, Zapatista leader, Subcomandante Marcos. Omar Hamed is undoubtedly one of New Zealand's most active and dedicated young militants. Is he also a "terrorist"? There is one significant problem with alot of your theories and such. Indigenous Peoples struggles are completly outside the left to right spectrum. We stand for self determination based on our respective values as Tribal Nations. Such assertions are not a threat to the US, Canada, New Zealand, etc. Fundamentally, as legally and politically distinct Peoples, why should someone form a Maori Iwi or hapu have to go to the local authority to build an outhouse on their own land? Simply put, it is about autonomy. The Left can be just as destructive toward Indigenous Peoples aspirations as the Right. These Leftists have very different agendas from those asserting tino rangatiratanga and mana motuhake. Our issues and struggles sometimes are aligned, but it is also fair to say that sometimes Right wing issues also align. For us, we will work with any who are willing to support us. Ultimately, for most of us involved in Indigenous Peoples assertions of self determination, it is oour traditional spiritual beliefs that form our philosophical political views, not the writings or actions of non-Indigenous. Send this stirrer to the Israelis. How do such ragtag malcontents get into this country? Omar is NOT a "terrorist"
i met someone who said they know him and that he is a "pacifist" despite his 19-yr old threats against B.ush that were wiretapped. If he was indeed a pacifist then why did he have a gun?? So presumably anyone who ever has a gun is going to use it for violence? ?